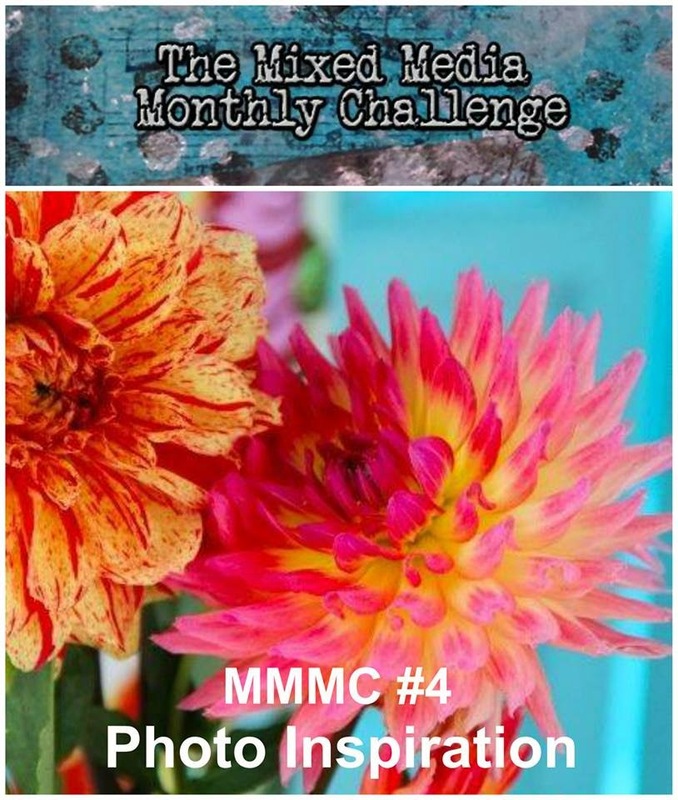 It's time for The Mixed Media Monthly Challenge #4 and it's a color challenge. Our designer Lynn Adams found this awesome photo that is so inspirational. Feel free to use as many or few colors in the picture as you like. We had such a huge response with so many amazing entries last month, I just can't wait to see what you all come up with this month. Remember, you can make anything, just mention how you were inspired by these colors. Our sponsor this month is Ellen Hutson, LLC, one of my favorite places to shop online for crafty items. They are offering a $25 gift certificate to our lucky random winner. So everyone who plays has the same chance of winning this great prize. For my card, I used a fun stamp called Sweet Dahlia by Penny Black that I purchased from Ellen Hutson here. I've been trying to practice more with my Copics so this card was a perfect place to try out some shading. I stamped it several times and practiced coloring it different ways until I finally settled on the way I liked it best. Of course I was inspired by the Dahlia and the beautiful bright colors in the photo. Here is the stamp. To make this card I started with a 5x5 PTI kraft card stock base. Then I added a layer of DCWV colored cardboard in blue and a layer of DCWV colored burlap in green and I inked the edges of the card with a green chalk ink edger. I framed the card with small kraft colored brads from Stampin' Up and twine from PTI. I stamped the image with Black Ranger Archival ink and colored it in with Copic Markers and inked the edges with yellow ink. I really like how this turned out and it was super fun to make. Thanks for stopping by and I hope you will play along with us this month!! 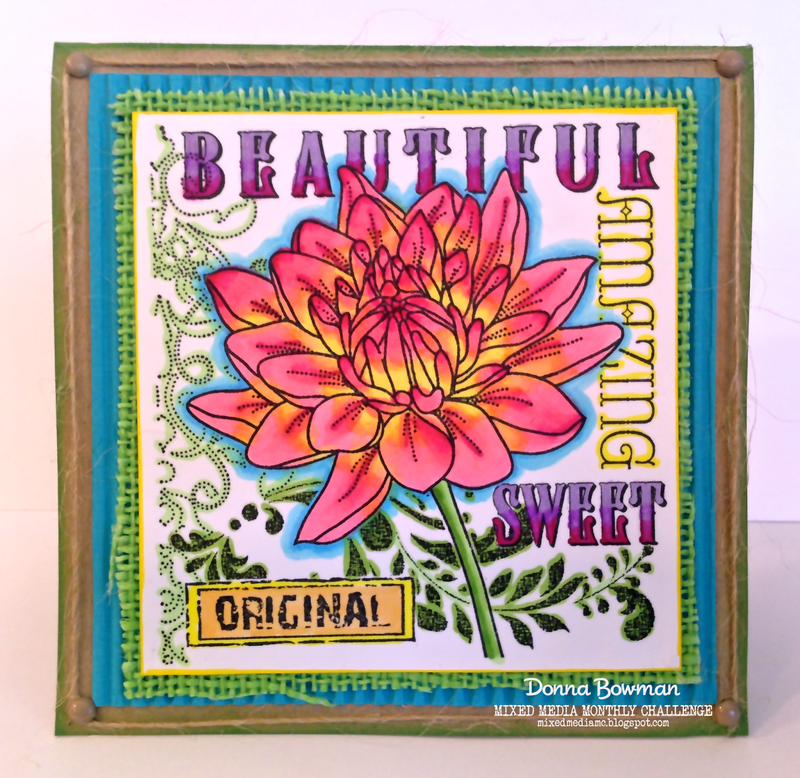 Great Mixed Media card - love all your shading and the Dahlia is beautiful! Wow!! This is so beautiful and your coloring is exquisite! You captured the colors beautifully in your composition, and the texture adds a lot of character to the design. Blessings! Beautiful coloring on your card. Very pretty!